Our triceps dip station for rack is an essential piece of equipment for improving your upper body strength, and it specifically targets your triceps and chest. 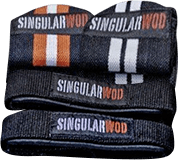 It is compatible with our range of Singular WOD racks, being easily attached with a safe quick release pin fastening system. The triceps dip station for rack is manufactured in the same black stove-lacquered structural steel as Singular WOD rigs are as it gives structures great strength and stability. Anchoring system: Quick release pin. Compatible with: Mobile Squat Rack, Rack + Pull-up bar, Power rack and Double power rack. And you can use them with almost any exercise. They are recommended for general conditioning, rehabilitation, jumping, aerobics, stretching and assisted lifting exercises.